Contains ultra-high antioxidant level of 15.95% vs 5-6% for mass-market teas. 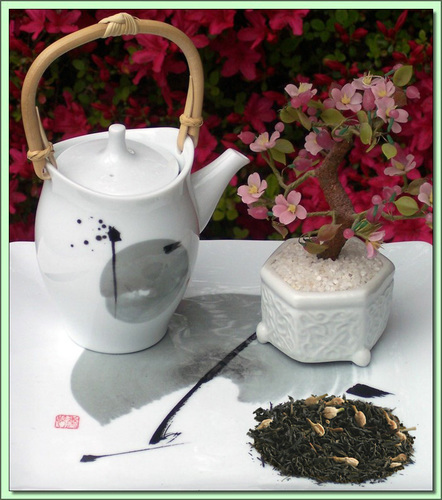 Character: Superb synergy of jasmine, green tea and luscious lichee fruit. Sweet fruit finish. This tea is based on a Sencha style green tea from Hunan. During manufacture, the freshly plucked leaves are steamed immediately and then bruised either by machine or hand. During the steaming process, the tea is layered with jasmine blossoms and lichee. Next the leaf is either pan-fired - a process that imparts a distinctive glossy look and feel - and dried. Unscented Senchas typically have dark green, needle shaped leaves and produce a pale green to yellow, very bright and smooth cup with a sweetish, honey like finish. The addition of juicy tart lichee and ethereal jasmine infuse the grassy green leaves with an added brightness and touch of pizzazz. The flavor of the tea is incredible - tangy notes of lichee dance above the exotic tones of jasmine intertwined with touches of honey, citrus and green apple. From the first sip you'll understand what makes it so popular. Ingredients: Luxury tea, Jasmine blossoms.